As more TV sets and source components such as game consoles, Blu-ray Disc players and media receivers require Internet access, the unavailability of a nearby Ethernet jack in your home theater or bedroom can stymie installation—especially when Wi-Fi isn’t an option. Laying down Ethernet cabling may require drilling holes through walls. But if you’re already a cable-TV subscriber, and especially if you have TVs connected to cable in more than one room, you can easily get double mileage out of the ubiquitous round white cables by attaching out-of-the-box transceivers that enable you to share data and TV channels without interference on the same in-home backbone. It’s as if an extended home network was already in place, but you just didn’t know it. 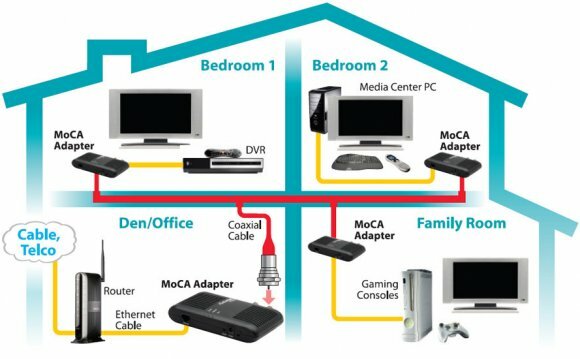 A variety of products for home use are available that take advantage of a home entertainment networking standard developed by the Multimedia over Coax Alliance (MoCA). Setup is mainly a matter of unscrewing the coaxial cable from your existing TV equipment, adding a small box plus cables, and tethering the pieces together. You insert the coaxial/Ethernet box between the coaxial cable that comes into your home and the RF input on your DVR or TV. You fit an extra leg of cable between the box and the RF input to which the cable was originally attached. Kits typically come with all the extra cables you’ll need. Besides in/out RF ports, the box sports an RJ-45 jack. You plug an Ethernet cable in here, which can link to your router or one of your networked devices. You then place a second coaxial/Ethernet box in line with your coaxial cable in another room and attach another Ethernet-needy device there. Each box, by the way, comes with an AC adapter, so you must have an available electric plug or power strip nearby. It’s a good idea to turn off everything before beginning and restart everything once all the pieces are connected. Setup is completed through an included CD on a network-attached Windows computer. Installation is not limited to a pair of transceivers. Up to 16 MoCA devices can be attached on your home network, so more Ethernet jacks can be added to your coaxial cable line later. As for throughput, you won’t get Gigabit Ethernet, but at upwards of 270 Megabits per second, the transfer rate is more than sufficient to blow away the fastest Wi-Fi and provide multiple streams of reliable high-def video.